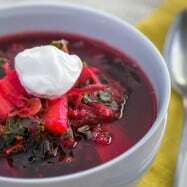 Finally, a borscht recipe with meat! I’m a borsch lover. To prove it, here’s my first borscht, my second borscht (an easier/quicker version of the first one), my superfood borscht and now this beef borscht for those of you who love a good piece of tender meat in your spoon :). Garnish: Sour cream and fresh sprigs of parsley or dill. 1. 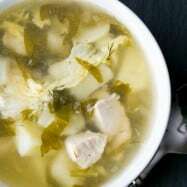 Wash meat in cold water, cut into 1″ pieces and and place in a large soup pot with 14 cups cold water and 1 Tbsp salt. Bring it to a boil and remove the foam crud as soon as it boils (if you wait, it will be hard to get rid of the crud as it integrates into the broth and you’d have to strain it). Lower the heat, partially cover and cook at a low boil 45 minutes – 1 hr, periodically skimming off any crud that rises to the top. Sorry I forgot to take a picture of the crud. Maybe we’re better off?? 2. Grate beets on the large grater holes (the food processor works amazingly well). Place them in a large heavy-bottom skillet with 4 Tbsp olive oil and 1 Tbsp vinegar and saute for 5 minutes, then reduce heat to med/low and add 1 Tbsp sugar and 2 Tbsp tomato sauce Mix thoroughly and saute until starting to soften, stirring occasionally (about 10 min). Remove from pan and set aside. 3. In the same skillet (no need to wash it), Saute onion in 1 Tbsp butter for 2 min. 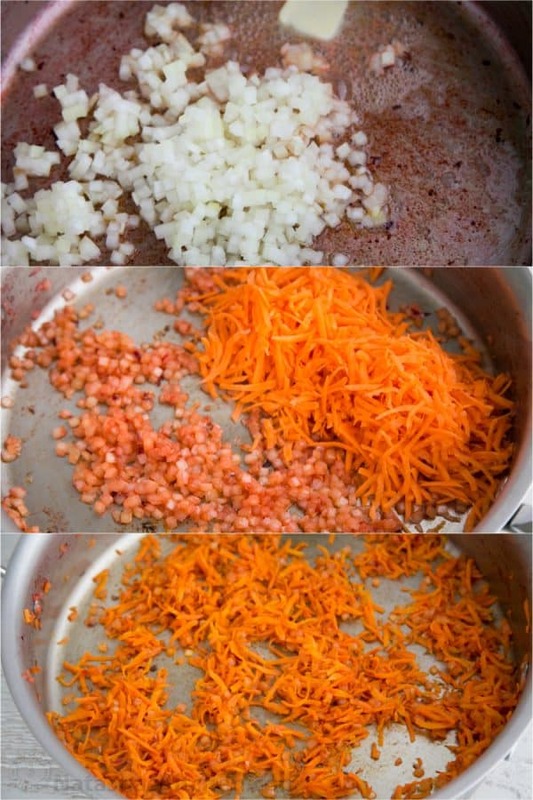 Add grated carrot and sautee another 5 min or until softened, adding more oil if it seems too dry. 4. 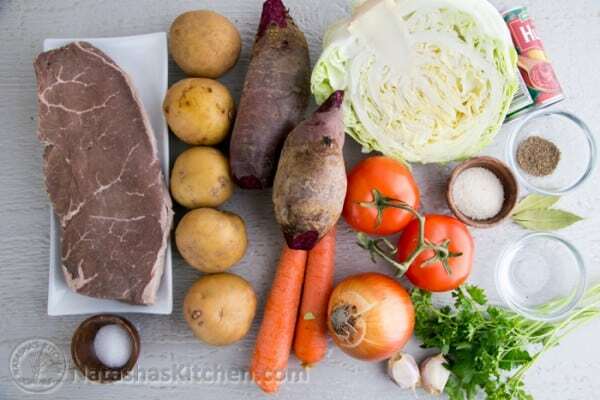 Once the meat has been cooking at least 45 min, place sliced potatoes into the soup pot and cook 10 min, then add cabbage, sauteed beets, onion & carrot, and chopped tomatoes. Cook another 10 minutes or until potatoes can be easily pierced with a fork. 5. Add 2 bay leaves, 1/4 tsp pepper, and more salt to taste (I added another 1/2 tsp salt). 6. Chop parsley and pressed garlic then stir them into the soup pot, immediately cover and remove from heat. Let the pot rest covered for 20 minutes for the flavors to meld. *P.S. Pork can be used also. And if your meat has a bone in it, place it in the water whole. 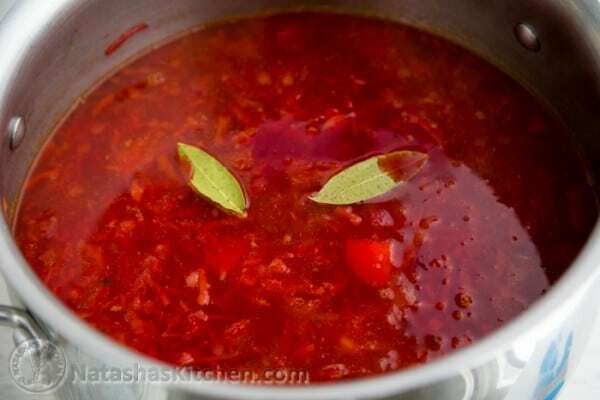 After it boils for 45 min to 1 hour, remove it from soup, cut away and discard the bone and cut meat into 1″ pieces). **To peel whole tomatoes, blanch them in boiling hot water for 30-45 seconds, then transfer to cold water and the skin should peel right off. 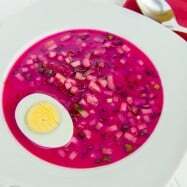 Borscht is originally Ukrainian but it is made by most Slavic people and is a very common food in Russia. P.S. The list of ingredients looks lengthy but they are simple. Serve hot with fresh sprigs of parsley or dill and a dollop of sour cream if desired. 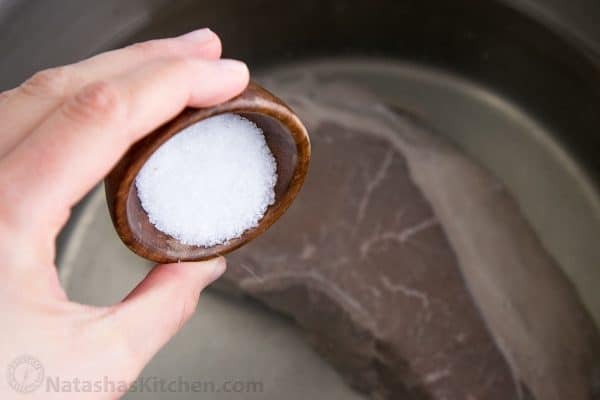 Wash meat in cold water, cut into 1" pieces and and place in a large soup pot with 14 cups cold water and 1 Tbsp salt. Bring it to a boil and remove the foam crud as soon as it boils (if you wait, it will be hard to get rid of the crud as it integrates into the broth and you'd have to strain it later). Reduce heat, partially cover and simmer 45 minutes - 1 hr, periodically skimming off any crud that rises to the top. 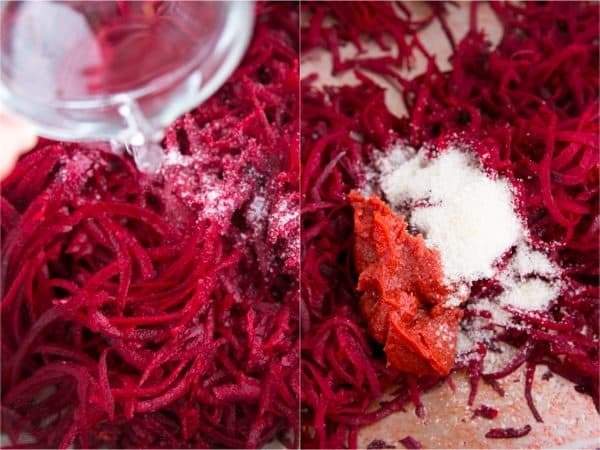 Grate beets on the large grater holes (a food processor works amazingly well). Place them in a large heavy-bottom skillet with 4 Tbsp olive oil and 1 Tbsp vinegar and saute for 5 minutes, then reduce heat to med/low and add 1 Tbsp sugar and 2 Tbsp tomato sauce Mix thoroughly and saute until starting to soften, stirring occasionally (about 10 min). Remove from pan and set aside. In the same skillet (no need to wash it), Saute onion in 1 Tbsp butter for 2 min. Add grated carrot and sautee another 5 min or until softened, adding more oil if it seems too dry. the soup pot and cook 10 min, then add cabbage, sauteed beets, onion & carrot, and chopped tomatoes. Cook another 10 minutes or until potatoes can be easily pierced with a fork. Add 2 bay leaves, 1/4 tsp pepper, and more salt to taste (I added another 1/2 tsp salt). 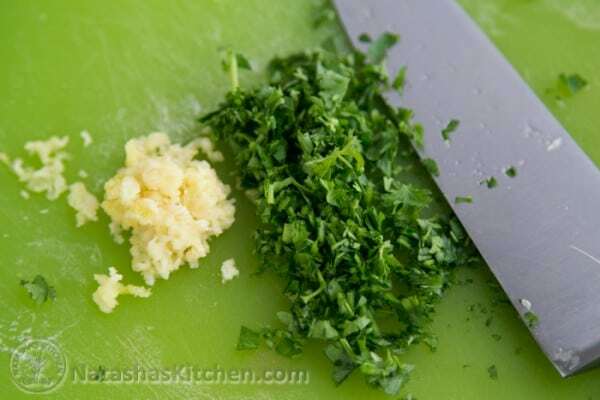 Chop parsley and pressed garlic then stir them into the soup pot, immediately cover and remove from heat. Let the pot rest covered for 20 minutes for the flavors to meld. *Pork can be used also. And if your meat has a bone in it, place it in the water whole. After it boils for 45 min to 1 hour, remove it from soup, cut away and discard the bone and cut meat into 1" pieces). Hello, Natasha! Thank you for posting this lovely recipe! We had a lovely neighbor who was Moldovan and would bring us big pots of Borscht every couple of months or so! 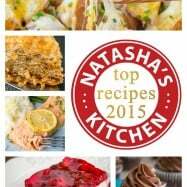 Natasha, I’ve never commented on a recipe site before, but I have to tell you–this borscht is superb. I grew up with the clear vegetarian Ukrainian borscht. This takes it to a whole other level. Thank you. I make this soup very often since it reminds me of my moms cooking. My husband and toddler say it’s their favorite! I do change the tomatoes up though- I add a can of diced tomatoes instead of fresh- it was a happy accident since I ran out of tomatoes but had canned and we liked it more this way. I also use pork instead of beef. 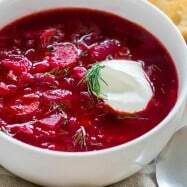 This recipe of borsch tasted lovely. The first time I tasted borsch was last year when I visited Russia. Actually I tried two different types of borsch, but none of them with meat. Just made borscht for the first time with this recipe. It tasted really good, everyone who ate from it had 2 servings! 🙂 Thanks! How could I tweak this to make a slow-cooker version? I tried but was not so successful lol. Hi Natasha! My wife, Olena and I got married a little over a year ago, after she moved to the U.S. from Odessa. She has missed Ukrainian/Russian food very much! But thanks to your recipes I can still give her a taste of her homeland! 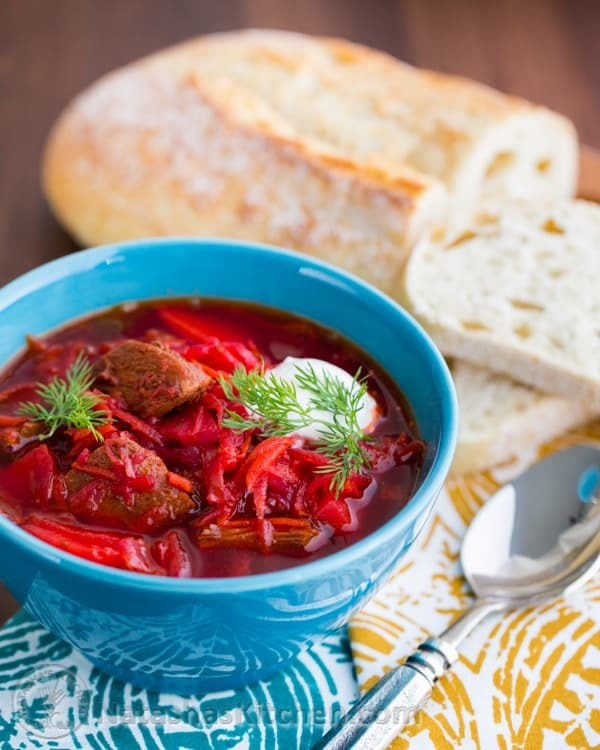 This recipe for Borscht has been her favorite (like her mom used to make it). Do you have a recipe for Solyanka? Thanks! Love your recipe and, as you said, there are a lot of variations. The borscht was fantastic! !God bless you and your family!! 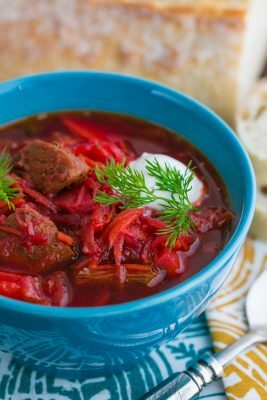 I’ve been making your Borscht for a few years now and we really love it! Thank you for sharing your recipe. About 6 years a go, I went on holiday to Estonia and tried borscht (and fell in love) – I probably had it six more times whilst there. I’ve never had it since, and was craving beetroot – so made this. Hello Natasha! I adore your site. I followed your borscht recipe but my meat was so tough, not tender. Do you have any advice? This is a very good borscht recipe imo, I liked the addition of meat. I followed this recipe yesterday – but added a small amount of vegetable stock powder at the end instead of adding more salt. It gave the borscht a very nice final taste. 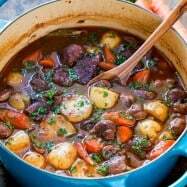 For the meat i used Irish stew meat. What kind of meat do you prefer yourself? I have a quick question for you. Would it be bad to cook the meat the night before and finish it the next day? This recipe involved a few firsts for me: Handling, tasting, and cooking raw beets, using dill weed. Natasha, I made this last night and could not stop eating it! Soooo Good! 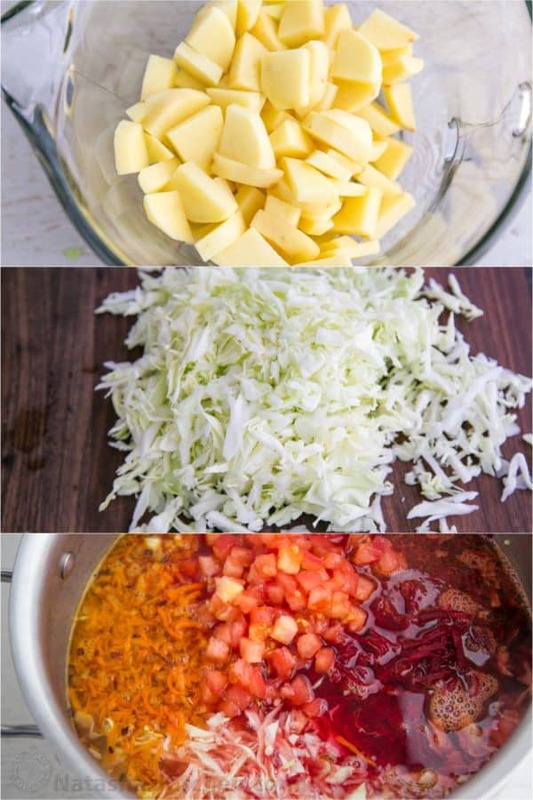 The taste of this borsh reminds me when my father used to make it! He put so much love in to it! He always added beans, so I had a can of Bush’s original beans. I drained about half a cup and added to my borsh! Yum! My husband loved it! The best borsh I have made so far! Thank you for the recepie! I wanted to ask, what do you think of using red cabbage instead of the normal green. Also I am going to use a Kassler pork chop which I shall boil and then shred into the soup, using the stock from the Kassler chop for the soup as well. Kassler pork chops are smoked. My German ancestors who lived in the Ukraine always used smoked meat–for them probably a matter of availability in late summer and fall when the other ingredients become available, for me a matter of nostalgia–a real Borcht as Mom and Oma made it, has a wonderful smokey flavor. I tend to use smoked turkey or chicken legs, but ham, sausage or any other smoke cured meat will do. I’ve made this before for my husband, who is from Siberia. He bragged about it to his entire family, who all wondered- how did an American girl learn to make borsch? When I told them where I had gotten this recipe from, they had already heard of you and loved you! Thank you so much for the excellent reviews! I’m so happy to hear you are enjoying the recipes! That sounds like quite a feast! made this borsch following the recipe from the website and I think that so far this is the tastiest borsch I have ever done in my life.